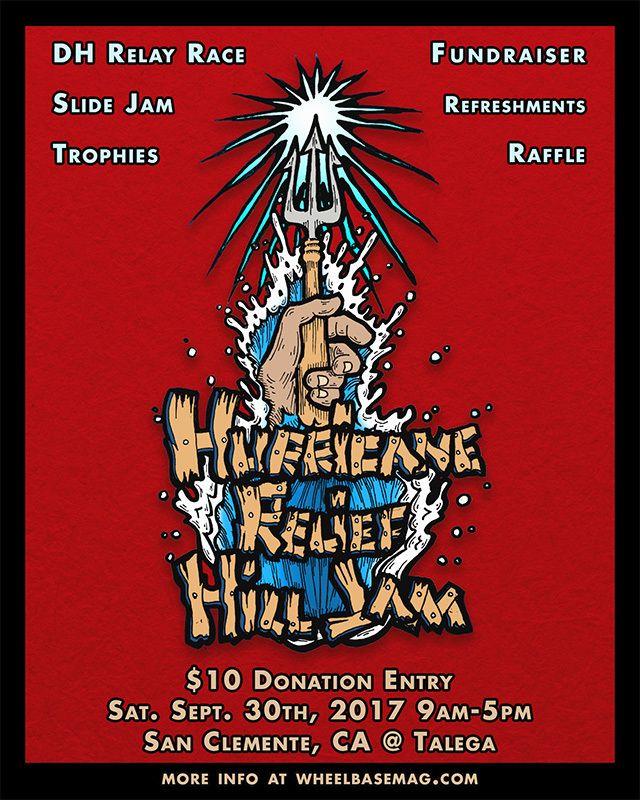 The Hurricane Relief Hill Jam is all about bringing the local Southern California downhill skate community together for a fun day of shredding to raise a couple bucks to help those who have lost so much during the recent and devastating Hurricane Irma. We here at Wheelbase Magazine will be donating $250. in cash to the event’s hurricane releif fundraising efforts, and we are requesting that all spectators & skaters please donate at least 10$ or more (cash only please) to help support the cause. Get Rad and Do Good! The event runs from 9am till 5pm and will include an early morning and laid-back relay race starting at 10am sharp, an all-day slide jam, a raffle, 3 hand-made trophies will be given out, refreshments shall be served (probably hotdogs), and 100% of all event donations collected will go directly to a VERIFIED Hurricane Irma relief effort. – RIDERS MEET AT 10AM! – RACING STARTS AT 10:15AM! – Finish line after the right hairpin. – Failure to have the baton at the finish will be a disqualification. – Any purposeful taking out of another is full disqualification. – There will be spotters at the corners to make sure everybody is off the road. – HELMETS AND GLOVES ARE REQUIRED!!!! (Knee pads and elbow pads are strongly recommended). – Entry is included with $10 donation. – Winning team shall receive a trophy. – We’ll start the jam promptly after the race. – There will be food at lunch time and as much water as we can bring. 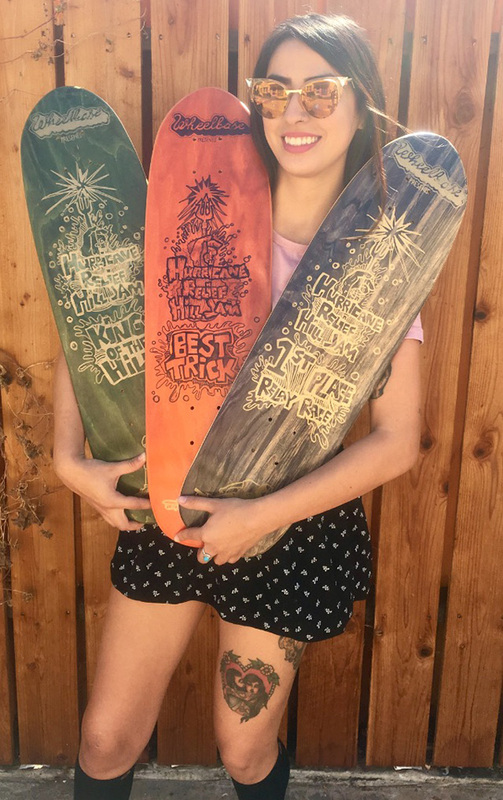 April and her hand-painted trophy decks for the event! – No congregating in the parking lot, skate safe, pick up all trash, be friendly and respectful to any and all local pedestrians, No drugs or alcohol at the even. ***And for those who aren’t racing, we would greatly appreciate having volunteers to help spot the corners for the race. There will be flags to make sure that the road is clear of skaters, pedestrians, or animals. R.I.P. N.S.A., Bonz Bros, Outlaws, & Sexuality Speakers – Weekly Wrap-up: Sept 23 – Sept 30, ’16 Donner Pass Downhill Race (Sept 10, 2016) Bad Cops, Collaborations, & Tour Clips – Weekly Wrap-up: Sept 19 – 25, ’15. Silhouettes, Savants, & Sick Graphics – Weekly Wrap-up: Sept 12 – 18, ’15.